Young girl playing with building blocks. Toddler activity centers divide the classroom into functional areas that support development and learning. The learning centers give toddlers a private area they can use when they need to break away from the group. This may reduce stress and aggression that can happens when toddlers are in a large group. 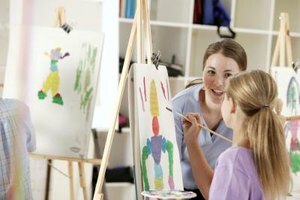 The key is to create age-appropriate centers that are also safe. 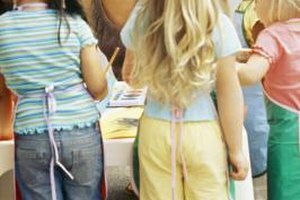 Toddler-friendly activity areas meet the cognitive, social, emotional and physical needs of the students. Private areas for only a few children allows the toddlers to withdraw and calm down emotionally. These areas also give two toddlers a place to build a relationship without distraction from the larger group. Dramatic play areas encourage toddlers to act out roles they've seen in their lives, such as parents or community helpers. This also helps toddlers develop social interactions. Building areas develop cognitive and problem-solving skills as the toddlers develop motor skills and coordination. 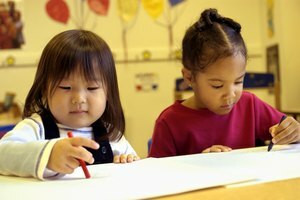 Writing and art centers encourage fine motor skills and creativity. Reading and writing centers support early literacy skills, but you can develop literacy in all centers by including relevant print. The dramatic play center might include food packages, coupons, ads and receipts in a store setup. You might include blocks with letters in the building center. Signs for each center also expose the kids to meaningful print. A nook surrounded by a storage shelf. The best location for activity centers is around the perimeter of the classroom. This gives you open space in the middle, for large group activities, and gives toddlers the space they need to move. It also increases safety by allowing the adults to supervise all areas at once. Look for areas whose existing dividers help separate the spaces. A loft in the classroom might be suitable as a reading nook. Your storage shelves can create borders for areas -- anchor the shelves so climbing toddlers don't tip them. A built-in half wall is another natural barrier for a learning area. Consider the type of space and resources you need for each center. For example, an art center is best near a sink for easy clean-up. Another consideration is the type of activities that are going on nearby. A loud building block or dramatic play center might distract toddlers who are looking at board books in a reading center. Put loud, active centers close to one another, with quieter centers in another area of the room. A toy wood train set and tracks. The materials need to be safe and developmentally appropriate for toddlers. All materials should be non-toxic, because toddlers often put objects in their mouths. For example, non-toxic tempera paint or finger paint is suitable in the art center. The size of the materials is a consideration. Small objects, such as marbles, buttons, coins, balloons, magnets and small toy parts, are a choking hazard to toddlers. Choose objects that are large enough for toddlers to grasp easily. Use paintbrushes that have thick handles or jumbo crayons instead of regular crayons, for example. The materials also need to stand up to rough toddler use. Board books made from thick cardboard won't rip, like traditional book pages. Wooden toys may take more play than plastic toys. Markers stored in a plastic cup. Set up the work space needed for each type of center. A building center typically just needs open floor space. Art, math, science and writing centers need toddler-height tables. A reading area needs book shelves and pillows or comfortable chairs. Each center needs a storage area to hold all of the necessary materials. Student-selected materials should be low so toddlers can reach easily. Put books on low book shelves or in baskets on the floor in the reading area. Store crayons and markers in cups on the table in the art center. Place a multi-level paper tray in the writing center. Put blocks and building materials in tubs on a low shelf. You may also need secured storage for teacher materials. For example, you might store paint on a high shelf or locked cupboard to avoid messes. Frost, Shelley. 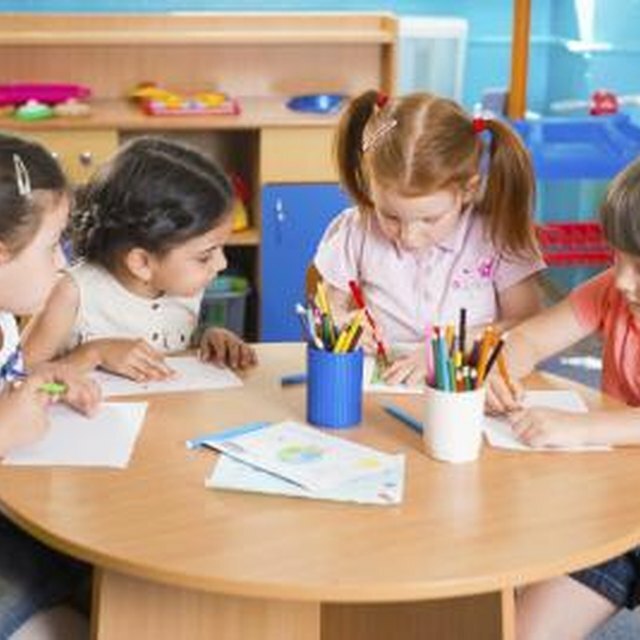 "How to Create Toddler Activity Centers in the Classroom." Synonym, https://classroom.synonym.com/toddler-activity-centers-classroom-2162777.html. Accessed 25 April 2019.